Last Thursday I made it to the opening of Ecologías Correlativas at 319 Scholes curated by chimera+ and was treated to excellent new work. The piece pictured above left the strongest impression on me as I think that it’s beautiful at many levels. “untitled slime moulds” by Dan Baker is a stop motion animation of mold seeking out food and surviving. The artist set up a backlit mold environment that he documented over an extended period of time. The final video isn’t simply a compilation of the stills, but rather the artist pans throughout the environment following the mold as it moves and grows, seeking food or dying. The animation is beautifully rendered and the manner in which the mold moves and expands appears programmatic. It brought to mind some of the more beautiful data visualizations that I’ve seen in different years, however this is a living entity moving in space. The piece immediately reminded me of Thomas Aquinas’s writings and his argument of geometry as the language of God. 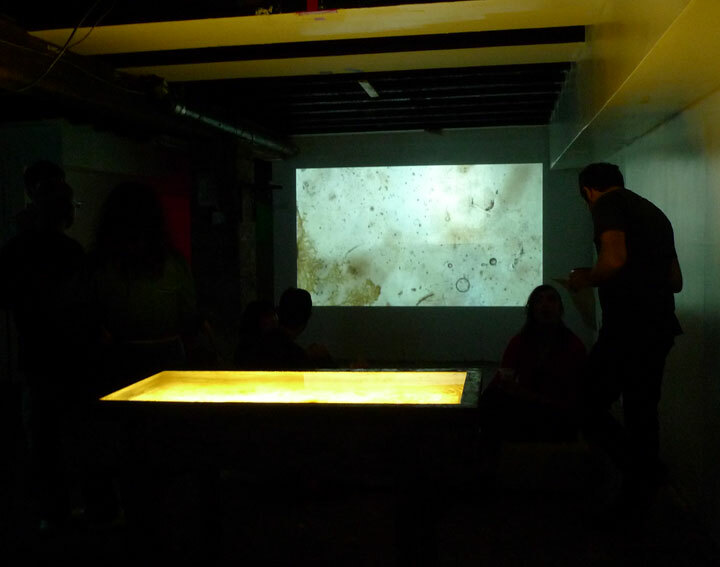 Although I have mixed feelings about my work in the show, projected in the back room and documented below, I was flattered to be part of a thoughtful and compelling exhibition that thematically stemmed from Félix Guatarri’s “Three Ecologies”. The beginning of the video “El Rito Apasionado” is available online. 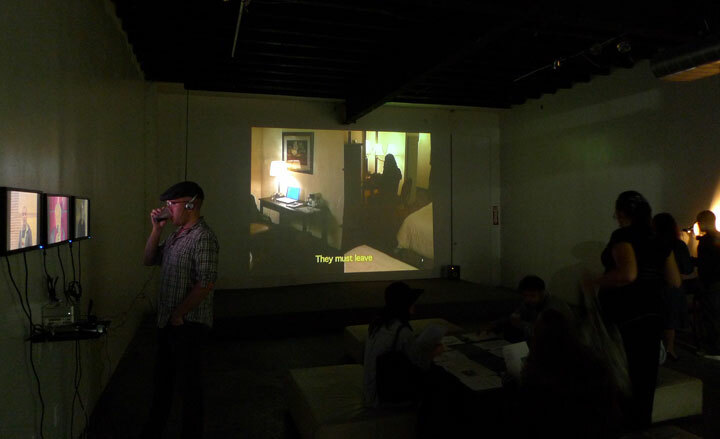 Rear gallery with "El Rito Apasionado" projected onto rear wall. Another piece that I thoroughly enjoyed is Miguel Soares “Place in Time”… brilliant! Miguel Soares, Place in Time from migso on Vimeo. 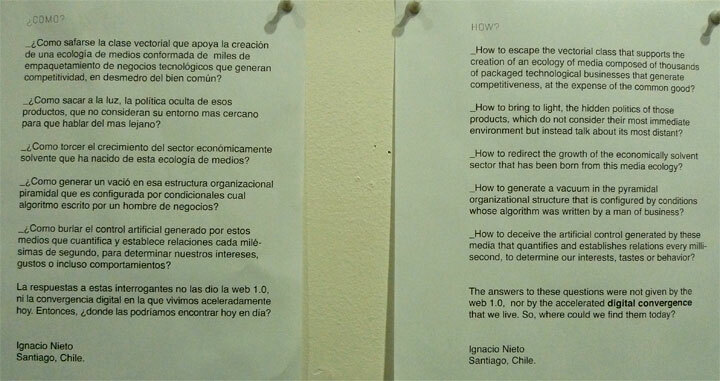 And below is a textual contribution by the Chilean artist Ignacio Nieto. The exhibition is only up until the 27 of this month and definitely worth the trip. Gallery Hours: Thursday – Saturday, 2:00pm – 6:00pm, and by appointment, 319 Scholes, Brooklyn, NY. I’m in a group exhibition titled “Ecologías Correlativas” at 319 Scholes curated by chimera+. The exhibition is thematically inspired by Felix Guattari’s “Three Ecologies” and the curators asked me to write a brief statement in response to the essay for the exhibition’s catalog. The following is what I submitted. I live with a three-year-old boy named Iggy in a household that does not have a television. Iggy has never seen a movie, and yet he recently demanded to be Lightning McQueen for Halloween. Over the past year, he referred to Lightning McQueen and the characters from Disney’s “Cars” merely as “Halloween Cars”. He did not know the names of the individual characters or that they were from a movie. Iggy only knew that he had seen many young children dressed up as “Halloween Cars” last Halloween when he was two. And since then he has observed toys, billboards, posters, books, magazines, lunch boxes, caps, t-shirts, backpacks, folders, bags, stickers, balloons, banners, flags presenting the image of Lightening McQueen or some other character from “Cars”. And then he visited his cousins in Connecticut, two boys, ages three and five that live with a 36-inch television that presents hundreds of cable channels. They regularly log extended periods of time in front of this television. Since that visit, he knows the name Lightning McQueen and would like to know the names of other characters, particularly the tow truck. He has developed a small obsession with “Cars”, a movie he has never seen. From the moment of conception onward, we are all subject to the phantasmagoria of commodity capitalism. It swirls all around us, captivates our imaginations, seduces our senses and consumes years of our lives. At times it can be stimulating and good, but for the most part it is noise, bad noise, not the type of noise that takes you on a voyage, rather the type of noise that conjures ambivalence. Currently, my partner and I are learning about schools for our son. Iggy is two years from kindergarten, however New York City is over saturated with children, so a parent must inform oneself as early as possible. There are not enough schools to properly serve kids and it is getting worse every year. I have recently learned a very important term regarding schooling – “entry point”. There are primary entry points to school – these are the years of a child’s life when there are the most seats available to gain entry into a school. A primary entry point into public schools is Pre-K – age 4. According to one friend younger siblings of kids already attending a given school largely take that entry point. So the next large entry point, because a class or two are added is kindergarten at which point in the public school system Iggy is entitled to a seat in his school district. Of course the problem then becomes overcrowded classrooms and poor learning environments, not to mention the goal to keep moving the kids along through examination and exam training. Besides the general public school system, there are charter schools and private schools. Both charters and private schools proclaim small classes, individual attention and alternative methods to various degrees. Private schools near my home range from $25k-$30k per year for pre-k through elementary school. Charter schools are publicly financed but independently run and free to experiment in classrooms. I believe that charter schools prosper through the financial and personal intervention of parents. Generally, I do not believe that a low-income parent has the means to financially or personally intervene in a child’s school. I may be mistaken, but I tend to consider charter schools as the privatization of the public school system. (Confronting IWC) will not come about through centralized reform, through laws, decrees and bureaucratic programs, but rather though the promotion of innovatory practices, the expansion of alternative experiences centered around a respect for singularity, and through the continuous production of an autonomizing subjectivity that can articulate itself appropriately in relation to the rest of society. 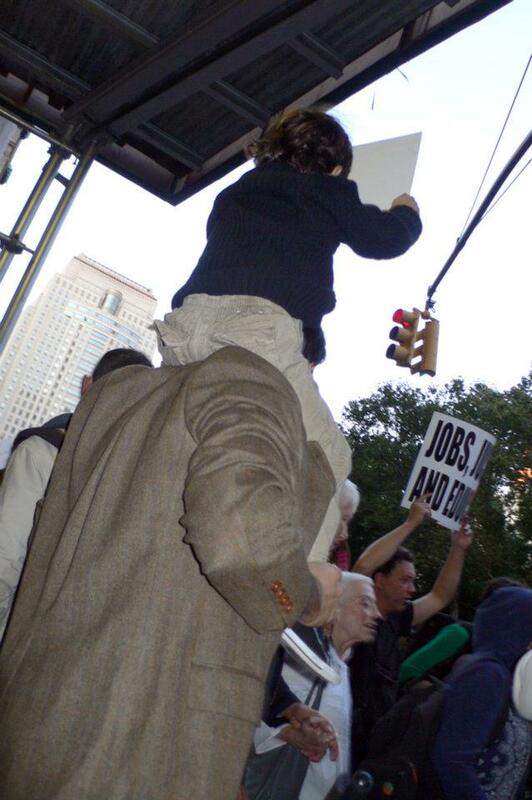 However, I am left wondering how bourgeois must we become to afford our son a good education. An education that will help provide the weapons to defend himself against the phantasmagoria of commodity capitalism through critical thinking and a nuanced perception of our society. NYC Police in the Pockets of Chase? We’ve built a country where the presidency must be paid for at excessive amounts, where lobbyists are simply part of the political fabric. Any sense of democracy is long gone. It is so explicit that Chase Bank basically announces that the NYC police will be working for them: Announcement of 4.6 Million Dollar donation to enhance security.